People will do practically anything to get an epic selfie to post on social media. From taking millions of them to jumping out of planes, there’s nothing that hasn’t been done in the name of creative self-imagery. Animals make a great addition to any portrait, and any selfie gets added cuteness points for containing an array of furry four-legged, or two-legged friends. These 15 selfies taken with animals not only received dozens of likes and comments, but they are so totally epic. Luckily, the images made it to social media for our enjoyment. The photographer is brave, putting his head so close to the goat’s horns, but the smile on the goats face gives off a reassuring vibe that nothing will go wrong. 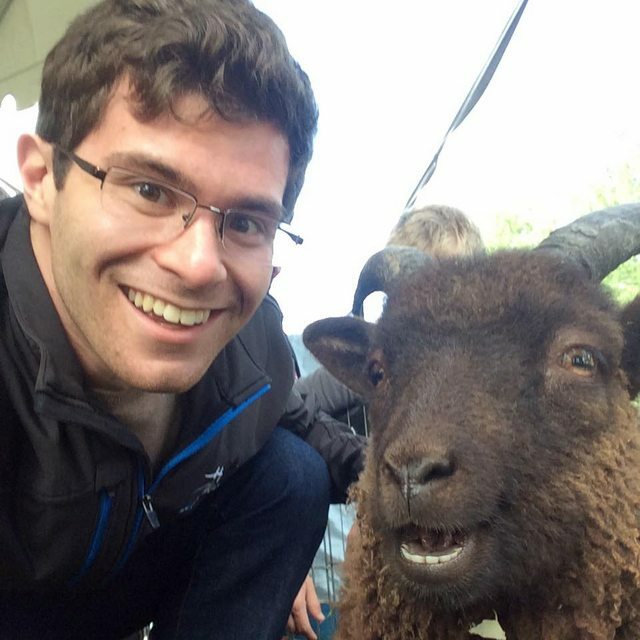 Perhaps the large smile is because the goat has never seen his reflection before, because honestly, how many goats do you know who have mirrors or cameras? This extremely creative photo was taken with, what I assume has to be, a very, very obedient and patient dog. The average pet might let its human dress it up, or take a strange selfie, but never the two together. Most dogs would shake off the hood faster than a photo could be snapped. But not this pup. While the expression is rather blank and stoic, the pose and statuesque stance shows the importance the dog is feeling. He knows this epic selfie depends on his cooperation, and he refuses to let his owners down, believing that perhaps a nice treat is waiting on the other side of achieving the proper angle and lighting. In the end, the stern look and upward-angle worked for the image. The hoodie, peace sign, stone-faced combo left the image with a very 1990’s, Biggie-era, rap vibe. Deer are usually afraid of humans, and run at the very sight of them. 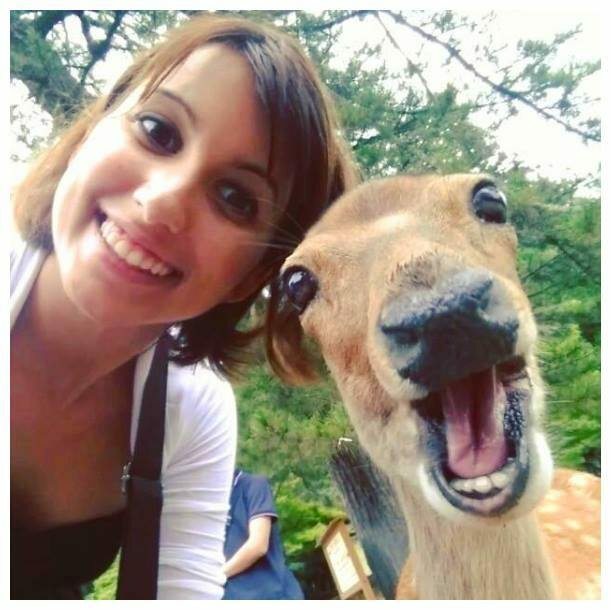 However, there’s no fear here, as an overly excited deer poses for a selfie. Deer parks have been popping up all over the United States in recent years, giving people a unique, first-hand interaction with these dainty darlings. In these areas in the United States where hunting is popular, the deer population ranges in the tens of thousands, and would create a dangerous nuisance for drivers and farmers if left unchecked. In places where deer are less common, the parks allow residents to learn about a species they might otherwise never see. This deer, however, doesn’t have anything to worry about though, no one could ever hunt down a jolly face like this. There isn't much life out in the desert, but that didn’t stop these three guys from catching an epic selfie with this giant camel. Not only is the camel smiling, but it bowed its long neck into the exact right spot to complete the guys’ pose. Camels are pretty miraculous creators, with special adaptations which allow them to survive the otherwise killer conditions found in dry, hot deserts. Rows of eyelashes line their eyes to help protect from sand, while their feet are specially crafted to spread out upon impact with sand to prevent sinking. These mammals can go days without food or water, and in times of crisis, camels can run up to 40 miles an hour, making them a speedy mode of transportation. Why would someone do this? Sharks are nothing to mess around with. 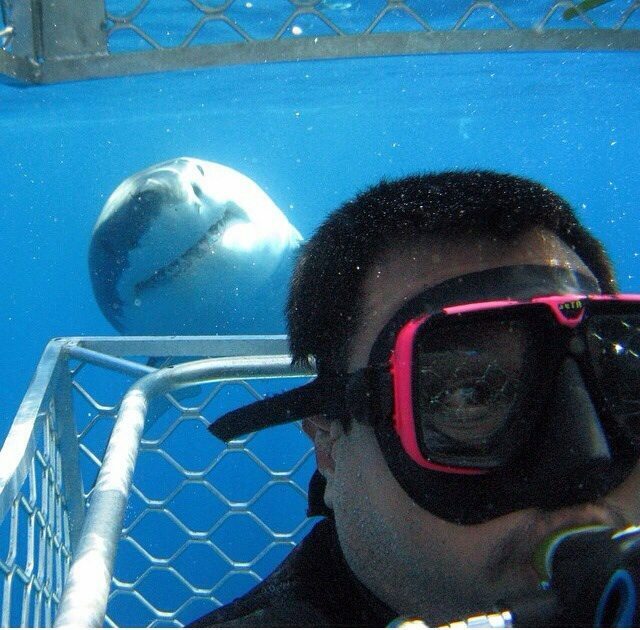 Clearly, the man is in a protective cage, but that gap looks wide enough to be jabbed by the killer great white’s snout. People are 30 times more likely to be struck by lightning, than to be attacked by a shark, but when doing stupid things like this, the chances are heightened a great deal. Their 3,000 razor-sharp teeth can tear through flesh and bone in seconds, leaving nothing behind but a bloody mess. Nothing is worth dying over, especially a selfie that could end up being your last. Look at the man’s eyes, even he looks a bit concerned, but when presented with the opportunity to capture a once-in-a-lifetime photo, Carpe Diem, I suppose. A lucky guy saw his opportunity and took it. Elephants are extremely intelligent, having the largest brains in the entire animal kingdom, and while it might not have actually taken the photo, it wouldn’t be a surprise if it had. These gentle giants eat up to 495 pounds of food per day, and travel up to four miles per day to keep up with their food demands. Herds contain entire families, led by the eldest matriarch. When one member of the family passes away or is attacked, it’s not abnormal for the entire clan to noticeably mourn their loss. Hunted for their ivory tusks, elephants are becoming more and more endangered every day. Companies like Ivory Ella are gaining popularity because of their efforts to help bring back wild elephant populations. By purchasing a t-shirt or other piece of apparel, customers are able to make their purchase count and help save elephants, too. There has never been a bigger internet sensation than Grumpy Cat. For the last two years, this famous feline has been seen everywhere, featured in dozens of magazines, and has been the inspiration for countless memes. Lifetime even gave the cat its own Christmas movie special, and there have been talks of a cartoon series. For whatever reason, this angry cat has made its way into America’s hearts, and we can’t seem to find a way to get rid of it. 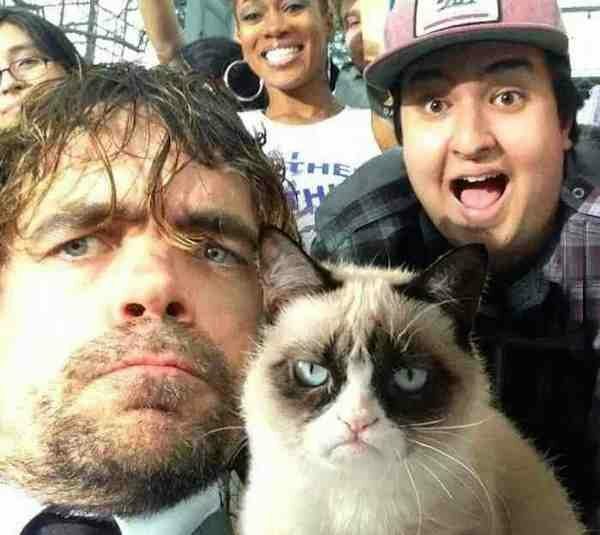 When actor Peter Dinklage got the chance to meet Grumpy Cat, he had to recreate the cat’s signature expression, while the other man in the photo is just too overcome with joy to stifle his excitement. Within moments of posting, between the famous cat and the famous actor, this selfie gained hundreds of likes and comments. Perhaps you’ve never heard of this adorable marsupial, but the quokka is actually known for its amazing selfie-taking skills. Not only are they extremely photogenic, they’re very sociable creatures, walking right up to visitors at local coffee shops and restaurants, with the hopes of getting a scrap or two. Although they have little fear of humans, it’s best to try not to interact if approached, and definitely do not feed them. Human food does not digest properly in these little herbivores stomachs. These critters are a close cousin to kangaroos, and also carry their babies, called “joeys,” in pouches on their stomachs. With strong legs, the quokka also love to bounce around, and have even been seen climbing trees. They live in a remote part of Australia, where they have little threat of becoming a larger animal’s prey. Surely we all remember Crush from Finding Nemo. That psychedelic sea turtle loved to catch gnarly waves and ride ragging currents, but we never saw him take a selfie. Luckily, this guy has found a real sea turtle and didn’t miss the chance to be photographed together. This picture is pretty epic, but sea turtles have a hard enough life dealing with human waste in the ocean without having to be interrupted by them to take pictures. Each year, hundreds of dead sea turtles wash onto shores all around the world, having been trapped by plastic rings or strangled by cut fishing nets. With a little common sense from humans, sea turtles wouldn’t have to be concerned about such devastating trash, and could have more time to swim freely and be available for selfies. While taking a trip Down Under, capturing a selfie with a kangaroo is something all travelers want to check off their bucketlist. This guy was lucky enough to not only get a selfie, but also a little affection from this cute marsupial. Baby kangaroos, like this one, are called joeys. When frightened, these little guys have been known to jump head first into their mother’s pouch, hoping to avoid danger and receive comfort. Kangaroos are the largest land mammals found in Australia, with booming populations. In recent years, scientists have calculated that for every human in Australia, there are at least two kangaroos. This means the kangaroo population is twice the size, if not more, than the entire human population living on the continent. Some people just have a way with animals. While most of us would cower with fear at the sight of this ferocious beast, animal whisperer Kevin Richardson welcomes it with open arms. He has traveled the world, taming all kinds of wild animals, from hyenas to tigers to lions. There have been many articles and news stories written on this miraculous man and his superhero-like powers. Having the bravery of Superman is a must when handling big cats. They can sense fear and agitation instantly. This instinct helps these animals hunt, allowing them to prey on the weaker members of herds containing antelope, zebras, or caribou. Because of over-hunting and loss of habitat, lion populations are struggling to survive. Hopefully, with new regulations put in place to sanction hunting and capturing, these big cats will once again thrive. Continuing on with the big cat selfies, this cheetah looks too chill while posing with the not-so-chill photographer. Can you blame him? Being that close to the fastest animal on earth is enough to make anyone a little nervous, even if this particular cheetah is tame. Knowing that in a fraction of a second, this animal could turn and attack would certainly be the adrenaline rush of a lifetime. These pretty kitties have special adaptations, like the dark markings on their face that reflect sunlight, which help them survive in the dry, hot, treacherous plains of Africa. Like lions, cheetah populations have been down in recent years. Cheetahs are hunted for their unique fur, which is made into coats, scarves, and throw rugs for the well-to-dos of the world. While traveling in Puerto Rico, Monkey Island is a must stop place for all animal lovers. For decades, scientists have been studying these rhesus macaques, trying to understand the dynamics of their living, family, and social structures. In 1938, the University of Puerto Rico created this sanctuary with just 409 monkeys, hoping to study their behavior. Today, the population has grown to over 1,000. This island, Cayo Santiago, is the oldest monkey colony in the world. The only way to the island is by a special ferry boat, which only takes six to ten people per trip. While on the island, visitors are able to interact with the friendly creatures, who have grown custom to the visits and are unafraid of humans. If given the opportunity, be sure to take a selfie or two. Another cute and cuddly animal from Australia is the Koala Bear. While these creatures are much more like sloths than they are bears, they have a close relation to neither. Instead, their closest cousins are kangaroos, wallabies, and opossums. That’s right, koalas aren’t bears at all, they’re marsupial, meaning they carry their babies in a pouch located on their bellies. These herbivores are specially adapted to be able to digest eucalyptus leaves and are even able to detect which leaves will taste the best. Out of nearly 600 different types of eucalyptus trees, koalas only feed on two or three strains. When they’re not searching for the finest eucalyptus leaves, koalas spend their time sleeping–nearly 20 hours a day. I think it’s safe to say, koalas might be my spirit animal. In the wild, hippos are the most dangerous animals found in Africa. They are very aggressive and territorial towards humans, due in large part to the constant encroachment of humans into their living environment. Luckily for this photographer, this hippo looks perfectly happy contained in her exhibit. It’s rare to see such large creatures in zoos anymore because of their sheer size and power. With one single chomp from those massive 20 inch canine teeth, a hippo can bite through a crocodile’s tough, leathery skin and rip it in half. Humans don’t stand a chance against these four-ton creatures. When mating season comes around, the animals become even more aggressive and have been known to charge without any warning. Running up to 20 miles per hour, when these land giants get going, get out of the way!